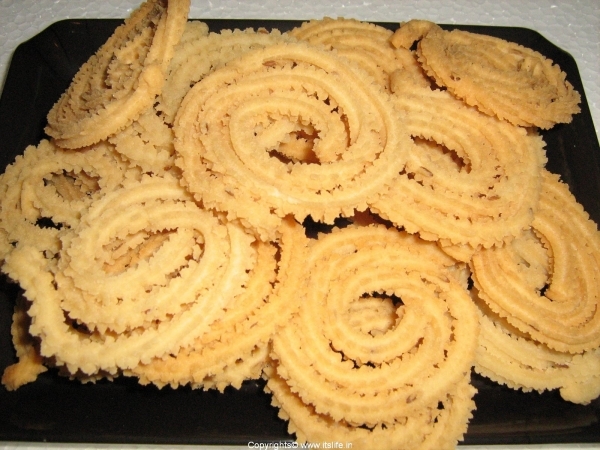 A salty fritter in the shape of concentric circles, which is commonly prepared in South Indian homes and a favorite among children. Chakkali is compared to the Moon and a rhyme goes like this “Chanda Mama Chakkuli Mama” / Moon Uncle, Chakkuli Uncle…Hence, it is prepared on festivals like Ganesh Chathurthi, Krishnajanmashthami and during Dasara to distribute to the neighborhood kids. Roast Rice, Urad Dal/Black Gram split, Fried Gram and Bengal Gram separately. Grind to a powder and sieve it. Store in airtight containers and use as and when required. Mix the ingredients except or Oil for the Chakkali along with water to make a soft dough. 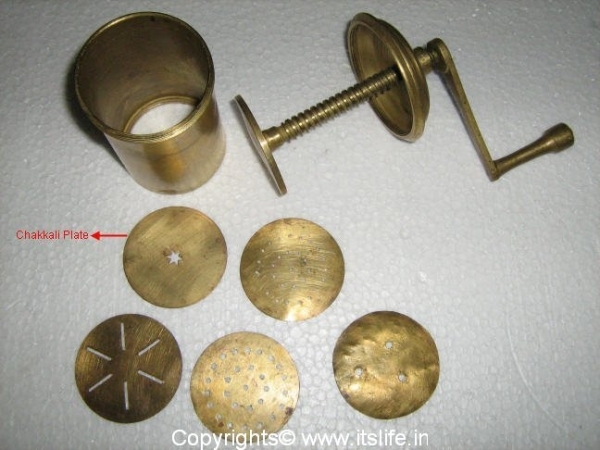 Select the round Chakkali shape plate, to prepare Chakkali in the mold. The mold is as shown below. Put dough portions into the Chakkali mold and press the dough on square pieces of chart paper in the shape of concentric circles about 2” in diameter. Heat Oil in a kadai/frying pan and slowly tilt the paper so that the Chakkali gently falls into the hot Oil. Deep-fry both the sides on medium flame until crisp and brown. Remove on kitchen towel and store in airtight containers. Hi …This is the easiest method of doing chakli at home…. Good to hear that your liked the recipe.